Stacktical and Hear&Know announce their partnership to connect Blockchain service level agreements to the real world using IoT tracking devices. PARIS, FRANCE — Stacktical, a Blockchain platform for managing Service Level Agreements (SLA), and Hear&Know, a company specialized in the tracking of contextual information using Internet of Things (IoT) devices, are joining forces to extend Service Level Agreements to the tracking of physical goods and medical patients. Expected to weight more that $1.2 trillion by 2022, the Internet of Things (IoT), a network of connected devices and sensors at the edge of the Internet, is revolutionizing the monitoring of goods and human activity as we know it. Yet the ability for IoT to drive business value to its stakeholders is undermined by the reliability of existing tracking devices, and the ability to leverage IoT data to improve business processes in tracking scenarios. This is particularly the case when tracking scenarios involve multiple stakeholders, such as in the Logistics and Supply Chain industry, when they involve offline and connectivity-challenged areas, and when the physical integrity of individuals is at stake. Our shared goal is to use the high reliability IoT sensors manufactured by Hear&Know and the Decentralized Service Level Agreements provided by Stacktical to help service providers transparently commit to the end-to-end tracking of goods and patients in pre-defined, auditable conditions. We hope to bring new levels of efficiency and trust in tracking scenario and in the settlement of tracking failures. “To efficiently manage the reliability expectations as well as the risk that tracking and transportation stakeholders are willing to bear, we need to connect Stacktical’s digital, Blockchain-based agreements with reliable, real world information. Hear&Know’s innovative sensors are uniquely positioned to help us do just that, even in scenarios where no local Internet connection is available.”, says Jean-Daniel Bussy CTO and co-founder of Stacktical. Stacktical combines the power of predictive and blockchain technologies to help service providers meet their service level objectives, reward operational excellence and automatically compensate customers for service failures. « This partnership makes it possible to better connect the blockchain to the real world », says Jean-Philippe Lelièvre President CEO and founder of Hear&Know. 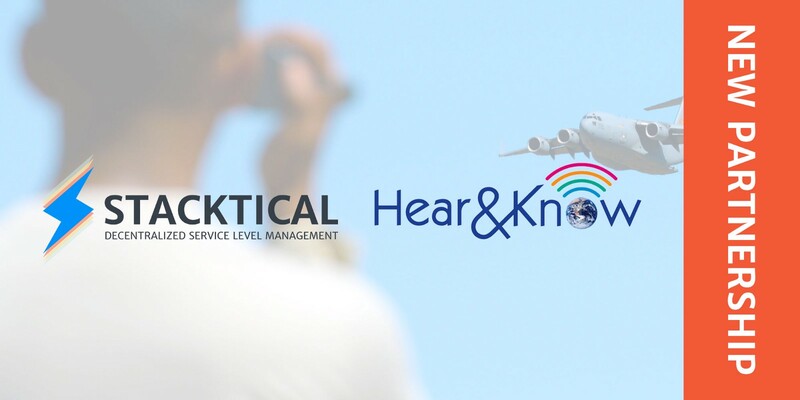 Hear&Know is a French startup providing geolocation solutions. Its innovative and awarded technology can geolocate objects and people both indoors and outdoors, without the use of GPS, without having to deploy any infrastructure and equipped with a long-lasting battery. Critical datas are sent through blockchains allowing end to end real time tracking and monitoring of goods. Hi, we're the team behind Stacktical and the DSLA downtime compensation token. A token that compensates users for downtimes.